Many drivers today like to take special care of their car. They want to know if the car is running properly at all times. Years ago, to find out if everything is in order, you would have to take your car to the mechanic and he would then check everything you wanted to know. With the technological advancement this is no longer the case. This was especially a nuisance if one of the warning lights lit up, but the car seemed to be running just fine. Today, that is no longer the case. Now everyone can easily do a quick check up and see if the car is running as it should. You no longer have to be afraid of those warning lights lighting up in the middle of your perfect road trip through a countryside, miles away from the nearest mechanic. The technological age offers an easy solution to any problem that may arise. The warning lights can come on without a reason, even if everything is working fine. But you don’t have to guess or worry anymore. You can now check your car’s system with just a few clicks and you don’t even have to be a car know-it-all. The market now offers handy OBD2 scanners that you can have in your car at all times. This makes it easy to do a quick scan right away, so you don’t have to worry if your car will malfunction and leave you stranded somewhere. The only problem might be that there are so many OBD2 scanners available and you’re having a hard time choosing the one that is the best for your car. We bring you the best products available on the market right now, helping you choose the best OBD2 scanner for your needs. We will now review the best OBD2 scanners available on the market at the moment. The reviews will explain in detail what each product does and what's the best way to use it. BlueDriver Professional scanner is a versatile product that can be used with most of the today’s popular devices. It connects to your smartphone via Bluetooth and all you need to do is download the app. Once you have connected the device and installed the app, you can access your car’s computer from your phone. The device is licensed and certified for use with both Apple and Android devices. The downside may be that it is not compatible with Windows phones. When it comes to scanning options, this OBD2 scanner offers many possibilities. The device can read and clear both CEL and enhanced codes. You can scan airbags, ABS, the transmission and other codes, along with insight into confirmed, permanent and pending check engine light codes. It can display live data and digital readout as well. Another useful thing is that you can use it to easily check emissions levels and make sure that your car is ready if you need to take an emissions test soon. The Mode 6 is also available, meaning that you can monitor the car’s systems continuously. This feature can for example record and store misfire counts. The manufacturer claims that they have over 30 million fixes stored in their database. This means that every report will have fixes so you don’t have to search further. This OBD2 scanner can be used on its own. It is a separate device that doesn’t require a connection to other devices to other devices, such as smartphones or tablets. 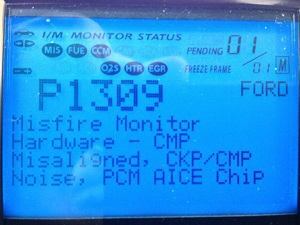 It has a TFT color display where it shows the error codes and scan results. All you need to do is connect it to your car and you’re good to go. The device comes in a handy case, equipped with a USB cable, OBD2 cable, user’s manual and a CD. One of the specialties of this scanner is that it has a patented one-click inspection monitor readiness key. This way you can easily verify drive cycle and emissions checks. The device also has an option to access manufacturer-specific and pending codes as well as VIN, CIN, and CVN. The freeze data is also available, as well as the live info on the performance regarding RPM and acceleration. You can read, record or playback the sensor data. You can use this scanner with any 1996 or newer vehicle. The scanner can also be connected to the internet and you can download the newest software to make it fully compatible with new vehicles. This scanner may not have all the options that most of the OBD2 scanners on our list have, but it deserves its place on the list solely due to its price. You may not get ABS, Airbag or TPMS scan, but you will get options like real-time scan of, for example, check engine light, RPM, DPF tempo or O2 readings. This is a handy and practical device that can help you out with basic checks for a reasonable price. The device is intended for use with Android and Windows devices. You will need a third-party app to be able to use the scanner and see the readouts on your device. The manufacturer will recommend the right apps for you. Keep in mind that you will not be able to connect the device to an Apple device. The manufacturer also guarantees that the scanner will work for all 1996 and newer cars. You will also get a two-year long warranty on the device, should there be any manufacturing defects with it. Another budget OBD2 scanner comes from Ancel. The device is one of those in the lower price range, but not necessarily lower quality. It is a user-friendly scanner that only has four buttons that you use to navigate through the device options. This simple layout means that you get two up and down buttons to navigate the menu, exit, and enter buttons. The scanner comes with a two and a half feet long cable to connect to your car. It is a standalone device that doesn’t require other devices or apps. With Ancel AD310 you will be able to check the cause of check engine light, IM readiness test, read memory and saved codes and turn off the check engine light. The device is compatible with 1996 and newer US made cars and 2000 and newer Europe and Asia made cars. The scan results are shown on its fairly large LCD display. It is also useful that the device doesn’t require any batteries or a charger. It gets power from the car once you connect it. This wireless OBD2 scanner is a small, compact device that connects to your handheld device through WiFi. It is compatible with almost all devices, including Apple, Android, and Windows phones and tablets. You will, however, need a third party app to be able to use it properly. As an option, you can also get a 3.9 feet extension cable for the scanner. The scanner includes over 3000 code definitions in its storage. It is compatible with all the cars that are built from 1996 to 2018. You can use the device to scan the existing problems on the car. It can access the on-board computer of the car and unlock data. You can also get live feed data streamed from the car’s computer. The manufacturer claims that the device is being improved constantly, including better WiFi range and app compatibility. There is no installation since the scanner is a plug-n-play device. The warranty is advertised as a 100% risk-free purchase. They offer a no-questions-asked return policy for one year. If you’re not satisfied with the device within the one year of use, they will give you your money back when you return the device. The Foxwell scanner is a universal device that can be used to check and diagnose most of the codes in your car’s system. It is a device that supports generic, manufacturer and pending codes. It should be fairly easy to use whether you’re a professional or you just need something that will help you with servicing your own car. There are many useful options that this OBD2 scanner offers. You will be able to check O2 sensor data, display fault codes, perform an onboard monitoring test and much more. There is no need for installation and the scanner can be used with the US built vehicles dating from 1996 and European and Asian vehicles dating from 2001. The device has a color TFT display and you can connect it to the internet as well. Internet connectivity enables you to update the scanner from the official Foxwell website. The update process is fairly simple, but it can only be done on Windows system. The scanner doesn’t require batteries or chargers since it gets power from the car once connected. ​This OBD2 scanner is one of the scanners that are at the higher end when it comes to price, as far as scanners for personal use go. But the price might be well worth it since the device offers a lot of extremely useful options. It has a 3.5-inch color screen and it doesn’t require any third party apps or devices. When it comes to options, it is packed with code reading and erasing options. With this OBD2 scanner, you will be able to access live data, read and erase the codes. It can be used to read and erase the codes for check engine light, for ABS/SRS codes, and for service light warnings. The scanner will also offer the repair solutions so you know what you should do. You’ll also be able to perform emissions check with it. It can be connected to the internet and the manufacturer offers free updates for the device. Another great thing is that you can update the device to be compatible with older OBD1 vehicles as well. As is, this OBD2 scanner can be used on 1996 and newer vehicles manufactured in the USA, Europe or Asia. ​Another Bluetooth OBD2 scanner on our list comes from ScanTool. This scanner can be used on 1996+ year cars sold in the US, but beware that it cannot be used with hybrid and electric cars. You must have an Android or Windows device to be able to use this scanner. It is not compatible with Apple devices. The manufacturer offers an exclusive app, but the device is compatible with third-party apps as well. As far as the options go, you can use the scanner to clear the check engine light, perform emissions check, calculate mileage and research fault codes on the internet. They also claim that the software will offer up to 400% acceleration with 4x the processing speed. You can also leave it plugged in at all times. It has an integrated battery saving technology and it will switch off automatically when not in use. The multi-layered security gives you a peace of mind and you don’t have to worry that a hacker will hijack the device. The scanner supports international variants of OBD2, as well as EOBD and JOBD. This OBD2 scanner can be used to the full extent only with newer cars. It offers four ECUs scan for the cars manufactured in 2006 and newer. The standard OBD2 test is available for cars manufactured in 1996 or newer. It is able to scan most US, European and Asian cars. You can easily update the software to get the latest features, but it may disappoint you that the software can only be updated on Windows, iOS is not supported. ​The device can check Engine, Transmissions, ABS and SRS with full OBD2 functionality. You can also use it to check the car’s emissions and clear CEL warnings. Live data and freeze frame data are also available. It is a multi-language device and you can choose the desired language in the settings. This OBD2 scanner comes with a one year warranty and a lifetime free software update. It does not require installation and it can be used straight out of the box. This is the advanced model of the Topdon scanner that provides you with the capabilities to scan your car’s system easily. It covers the biggest 24 car manufacturers, but the ABS and SRS checks can only be performed on 2006 and newer models. You can use it to determine why the check engine light is on and you can turn off the warning lights as well. The device also has a multilingual menu, so you can choose your language in the device’s settings. You will need to update the device if you want to be able to use the two system diagnosis. The full OBD2 functions contain features from mode 0A to mode 09, including emissions test monitor, vehicle information read, current trouble codes read and other. Keep in mind that you will have to visit the manufacturer’s website and download the tools to register and upgrade the IBD2 scanner. Their customer support also seems to be good and you can contact them if you need guidance through the process. It may seem hard to choose the best OBD2 scanner for your car, but it all comes down to your need. You should read the reviews carefully, keeping in mind what is it that you need from the scanner. We have ranked the best OBD2 scanners in general, focusing on all the options that they offer, as well as the price of the device. Considering all the features, we’ve come to the conclusion that we can recommend the following three devices as the best option for almost any user. Number one on our list is the BlueDriver OBD2 scanner. The reason we chose it as number one is that it has a great value. You get all of the options that you might need from a scanner, for a reasonable price. It is a Bluetooth device and it works with both Android and Apple devices. The user interface looks great and easy to use, once you choose the right app. We’re sure that this IBD2 scanner will offer you everything that you might need. The second scanner on our list is Autel AL519 AutoLink. This reasonably priced OBD2 scanner provides more than just basic scans. It will retrieve almost all vehicle information and codes. You can use it to turn off malfunction indicator light and the device can read, record and playback live sensor data as well. It has a lot of options, but we must say that the build quality may have been a bit better. Our third pick is a device that has an unbelievable price in our opinion. This was the main reason to rank the device this high on our list. It does have a limited number of options, but if those options are all you need, then this is the best OBD2 scanner for you. You can use it to read and clear the check engine light, monitor O2 sensor and check the temperature of every fluid in the car. It works with Android and Windows devices and comes with a two-year warranty. When it comes to the best value, our third pick, BAFX Products Bluetooth Diagnostic OBDII Reader, would be our recommendation. You can get this device for cheap, but it will offer many useful features. Even if you don’t get all that you wanted, you will still not be disappointed. At this price, we’re pretty sure your satisfaction is guaranteed. Plus, you have a warranty, so you can return it if it doesn’t meet your needs. Our pick for worst value is not necessarily the worst value, but it is by far the most expensive OBD2 scanner on our list. The device in question is Innova 3160g Code Reader/Scan Tool. It may have a lot of useful options, but we think that you would be better off with a cheaper device once you pinpoint what exactly do you need from an OBD2 scanner. This device is for those that require almost fully professional vehicle scans. It will take some time for it to pay off, depending on how much you pay your local mechanic to perform a scan and how often you take your car to the garage. All of the devices on our list seem to be very popular on Amazon. The one that leads the way with most reviews is the BAFX Products Bluetooth Diagnostic OBDII Reader / Scanner, sitting at 10 240 customer reviews. We do think that this is due to the fact that the device is really cheap for what you can get from it. One satisfied buyer says: “I know I had car issues but not to this extent. I was able to track down every issue (7) and figure out what it was gonna cost me. Literally saved me $700 from what the shop was gonna charge me to fix them. Makes me wonder if they were trying to rip me off”. By far the most popular OBD2 scanner we’ve reviewed. In second place is our overall winner BlueDriver Bluetooth Professional OBDII Scan Tool. This just goes to show that the product is actually really good. At 2899 Amazon reviews, it holds a great second position when it comes to popularity. Considering the price, this can tell you a lot about the product. Happy customer reviews: “I should've written a review for this a long time ago. This thing saved me money. And I mean a lot of money. I recently bought a used car and this helped me weed out like 10 lemons. Ended up buying a car that was in much better shape for a really good deal.“ Quality and compatibility, as well as all the features, are what makes this device so popular. The third spot for popularity goes to ANCEL AD310 Classic Enhanced Universal OBD II Scanner, our fourth-placed scanner. This OBD2 scanner has 2282 reviews on Amazon, which makes it a popular option amongst car owners. The price certainly helped when it comes to its popularity, but the user interface and scan options pushed it forward as well. A satisfied buyer claims:” I have an older scan tool, that I paid $300 for back when I was a mechanic, that covers OBD1 just to tell you how old it is that doesn't do half of what this scanner does. No batteries required and it easily reads the PID's for diagnostics plus it immediately explains the codes that pop up. Great investment for a mechanic and do it yourself types.” Another great thing that helps this device gain popularity is certainly the fact that the manufacturer offers a three-year warranty on the device. There are many similar reviews of the scanner and it has a rating of 78% five-star reviews. It was certainly not easy to pick the best OBD2 scanner, considering that the competition is so fierce. Nevertheless, you’re reading this article because you wanted to find out exactly that. Therefore, we’ve decided that the BlueDriver Bluetooth Professional OBDII Scan Tool for iPhone, iPad & Android is our top pick and a recommendation. The device is extremely useful and practical. It can be used with both Apple and Android devices, which certainly makes it a popular choice. You can perform almost all diagnostics that you might need and the price is exactly right. You can expect brilliant performance and results. The device should pay for itself quite soon since you no longer have to take your car to the mechanics every time a warning light comes on. We think that this device is a great investment for both personal and professional use. This device is also our top recommendation when it comes to the best Bluetooth OBD2 scanner as well. Again, BlueDriver Bluetooth Professional OBDII Scan Tool for iPhone, iPad & Android. It is our overall winner for a reason and one of the reasons why is the fact that it works brilliantly with iPhone and iPad. You have many options and a dedicated manufacturer app to combine this OBD2 scanner with, making it easy to use with Apple devices. The device will connect to the Identifix professional database and you will get the fix suggestion on your phone right away. You don’t have to search the internet to find the solution, everything is right there in the app. If you want to be able to check your car on your iPhone, this is the best OBD2 scanner for you. There are some simple things that you need to keep in mind when using the OBD2 scanner. 1. Before you purchase the OBD2 scanner, make sure that it will work with your car’s system. Some scanners have a limited number of vehicles that they can access. The good thing about this is that almost all of them will have a list of compatible vehicles listed in the product description. 2. Make sure that you don’t delete or remove the codes from the device before you’ve done the repairs. If you’re not going to do the repairs yourself, make sure that you’ve recorded all the fault codes before taking the car to the mechanics. Although most mechanics will do the scan themselves, you can then compare the results and make sure that they don’t charge you with unnecessary costs. 3. If you’re going to do the repairs yourself, make sure that you understand what needs to be repaired. If your scanner doesn’t have repair suggestion option, you should refer to the user manual to pinpoint the issue. Some error codes may show similar results and faults. This is why you have to check in detail what the actual fault code is. If you’re one of those people who like to do the car maintenance themselves, you’ll certainly need to own an OBD2 scanner. If your car starts showing signs of malfunction or one of the warning lights comes on, this is when the OBD2 scanner comes into play. Instead of doing a visual inspection and wasting hours trying to pinpoint the issue, you can easily find the problem by simply connecting the scanner and performing a quick scan. If your scanner has a repair suggestion option, you will save yourself a lot of time. Instead of wasting your time on diagnostics, you can use that time to perform the repairs. Use the OBD2 scanner every time you feel something is wrong with the car. Even preventive scans are recommended because you can then plan the repairs in advance. With so many people owning a car these days, the car maintenance industry is at its high. You can find repair shops and garages at almost every corner and they usually offer troubleshooting services for a certain price. With the technological advancement, you no longer have to pay for these scans every time you feel that there’s something wrong with your car, or the check engine light comes on. You can purchase the scanning device and it will certainly save you money in the long run. The great thing is that you can now use these devices with your smartphone. As you’ve already read, our top pick for the best OBD2 scanner, BlueDriver Bluetooth Professional OBDII Scan Tool for iPhone, iPad & Android, lets you do exactly that. You can simply perform all the check on your vehicle by just plugging in the device and downloading the app. It saves you time, money and in some cases health because you no longer have to stress about your car’s condition. Make your life easier and get an OBD2 scanner for your car. It will be well worth it. Have you used any of the products in this review? Do you have any advice or suggestion for the other readers? Let us know in the comment section below! *Emissions.org is a participant in the Amazon Services LLC Associates Program, an affiliate advertising program designed to provide a means for website owners to earn advertising fees by advertising and linking to amazon.com.